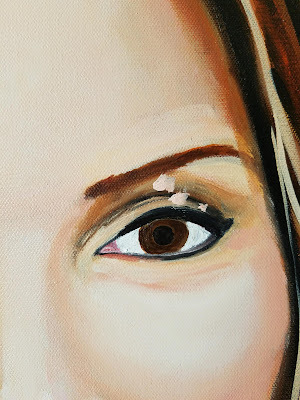 Shawn Christopher Mooney: Sharing my love of art and life, with a little wine mixed in. I often find myself painting in more than one color at a time and using more than one brush at a time. I always make the same mistake and end up not only mad at myself but spending time correcting a painting that could be better spent. 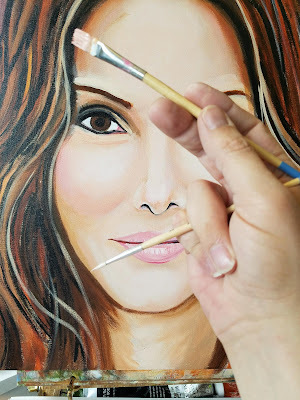 The picture below shows how I usually end up holding brushes without even thinking about it. I just naturally end up holding brushes this way when I'm in the zone and don't realize the error until the "oopsie" is made. This is the inevitable result of holding multiple brushes this way. Luckily I wasn't very far along on this portrait so it wasn't a huge deal to correct. 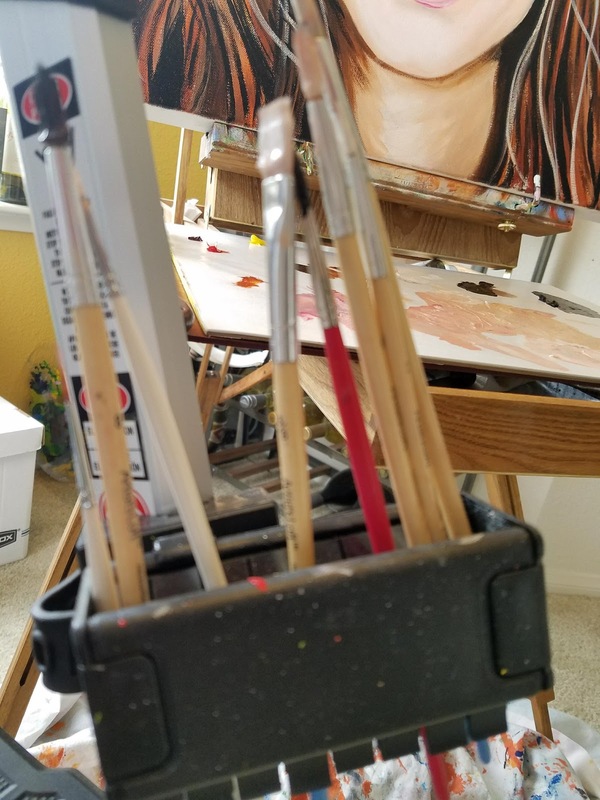 I think I hold brushes that way because I had nowhere else to put them, having had several brushes that I had haphazardly placed on my palette just roll off onto the floor and create more mess. I found this Brush Grip Brush Holder and while I absolutely love it, it hasn't completely stopped my horrible habit but it does help curb it to a minimum. It is completely adjustable and attaches via a rubber strap right to my french easel. I often attach it to a small ladder shelf I keep in my studio for more portability. If this doesn't help anyone reading, at least it serves as a reminder to me. "Don't hold two brushes in one hand." Hi Shawn! Back in the day, when I painted with painted with oils quite a bit, I used paper plates so I could lay the brushes down. It was inconvenient because the flimsy paper plate had to sit on a table near by, instead of right on the easel. It made it very hard to break the habit of holding more than one brush. How great is the Brush Grip?! Thanks for the tips and product info. I'm loving your work. When commenting please remain respectful.